Discover just what the typical tuition is for U.S. students around the nation, and how Cal U stacks up. Get a better idea of the tuition and fees charged by Cal U in order to prepare yourself properly for the next 4-6 years. Examine the numbers following to learn how Cal U's price stacks up to other colleges and universities and if you need to prepare for tuition increases. How do Tuition & Fees at Cal U Compare With Other Colleges? For nationwide, regional and statewide comparisons, view the following table to find out how Cal U compares to other colleges. The cost of tuition and fees at Cal U is reduced significantly for students living in Pennsylvania. Tuition and fees for in-state students is set at $10,840 for the 2017 - 2018 year, a 29.3% discount off the full price. Tuition is $7,492 and fees $3,348. Out-of-state students at Cal U spent $15,326 in tuition and fees in 2017 - 2018. $4,088 was fees, and $11,238 was charged for tuition. View the following table to find 2017 - 2018 school year costs. Looking for cost per credit hour? Find Cal U cost per credit hour here. Are Tuition & Fees Increasing or Decreasing? 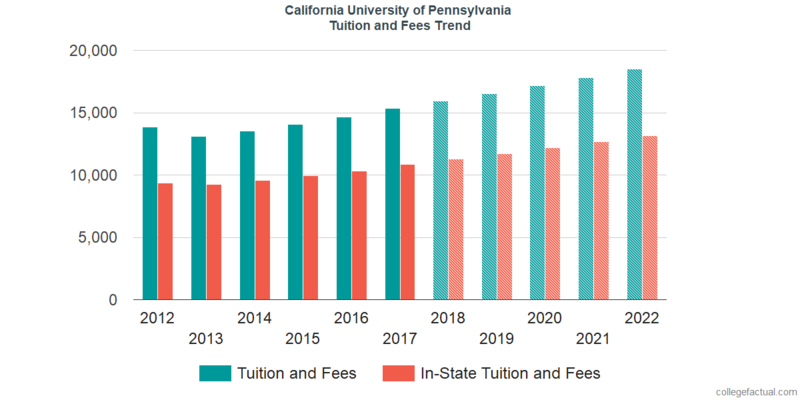 California University of Pennsylvania tuition and fees for out-of-state students increased at a standard annual rate of 3.8% within the last five years. Over that same period, tuition increased by 3.0% and fees increased by 5.2%. Due to this, we predict the price of tuition and fees for this year will be $15,913. At this rate, we estimate the total cost of tuition and fees for a two year degree to be $32,435 and $67,403 for a four-year degree. This doesn't include other costs for example room and board, transportation, and books. The subsequent chart reveals predicted upcoming tuition and fees including residency based reductions for undergraduates at Cal U. Be aware of just how much the tuition and fees are rising each year. At a lot of colleges students will wind up paying a larger price for their last year of school compared to what they did for their first. Learn answers to your financial problems in the tuition & fees FAQ.